← I’ve named my fear. A successful workout can be like pulling off a magic trick. * It can be a little surprising, leave me a little awestruck, and then I might feel pretty dang pleased with myself. The Point to LaPointe swim race is in two weeks. My training has been not terribly focused and a little spotty. There have been weeks I didn’t get any swimming in. While I have no intentions of being impressive, I’d also like to have a respectable, not embarrassing race. So two weeks ago I did my longest open water swim of the season. It was roughly 4,400y in about 1:30. Not only did I do it but I didn’t waste time half way through trying to talk myself out of it. Even when I was off pace and could have thrown in the towel. I just plowed ahead and got it done. 4,000y in 1:10. Even better than last year. *I feel like I should add… like any good magic trick, it’s not actually magic. It’s not like tons of work doesn’t go into being able to pull off a magic trick. It’s just sometimes even the person trying to pull it all together has doubts and is a little surprised when it actually works. This entry was posted in Fitness and tagged lake swimming, open water swimming, Point2LaPointe, pool swimming, racing, swimming, training. Bookmark the permalink. 2 Responses to Ta-Da! 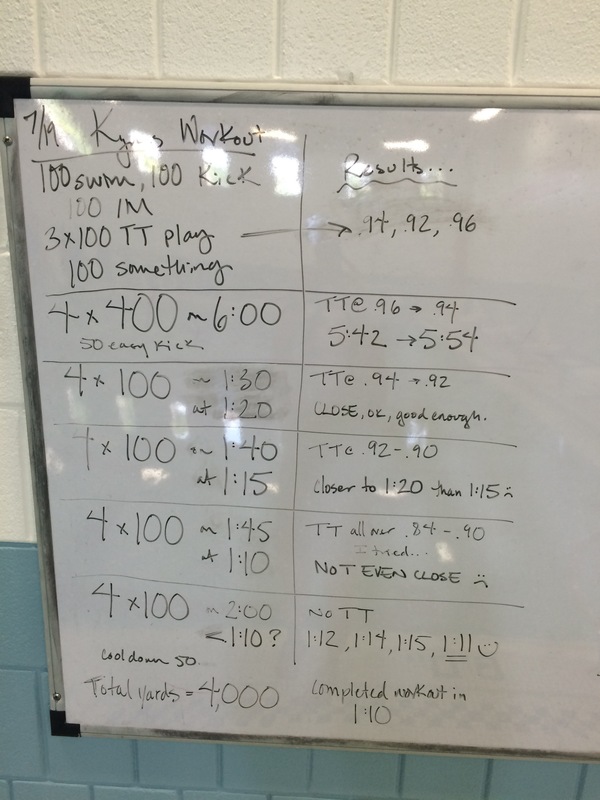 A swim workout! Good for you, Kym. Since I’m not nearly as disciplined as you, I like my lake better than pools – never boring. I’ve even taken to wearing my glasses when I swim, which makes it clear that I’m definitely a casual swimmer, not competitive. I never know what I might see. My last swim started out with a pair of loons flying right over me, their necks and wings lit golden by the setting sun. Breathtaking. it ended with an eagle flying out to me, looking down, turning around and going back where he/she came from. I’m glad for the eagle eyes that knew I wasn’t a duck dinner.